Marigold, a seventh grader at Lakeland Elementary/Middle School, moved through the crowd with the poise and professionalism of a public relations veteran as she guided visitors through the Lakeland Community and STEAM Center on their first visit to the new space. The South Baltimore center opened its doors on June 1, after a two-year, $1.6 million renovation and programming revamp supported by the Northrop Grumman Foundation and Northrop Grumman Mission Systems in partnership with UMBC. Other contributors included the Harry and Jeanette Weinberg Foundation and the South Baltimore Gateway Partnership. Students and their supporters quickly filled the fresh space, excited to view its state-of-the-art equipment and learn about the activities it will support. “Marigold is a perfect example of a student who dives into not only school, but extension opportunities,” shared Lakeland Principal Najib Jammal. Her experience shows how “being involved” in enrichment activities “can accelerate learning and growth,” he said. 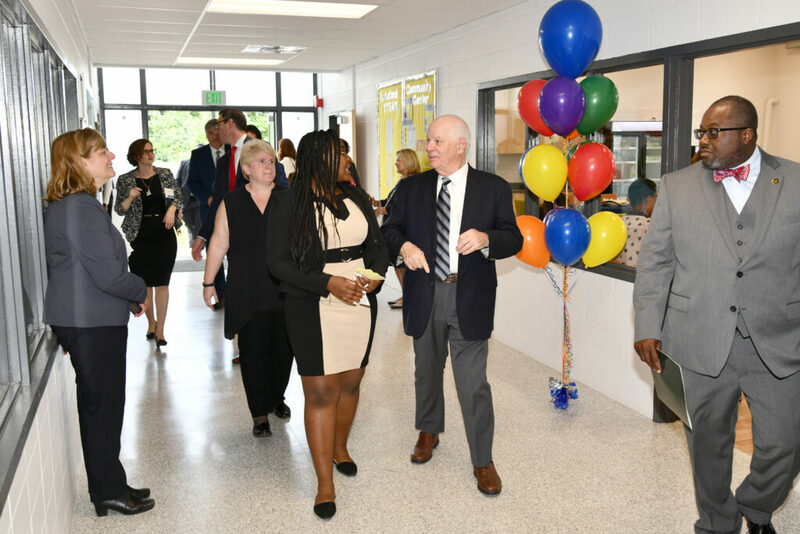 Sen. Ben Cardin (center right) greets Lakeland Elementary/Middle student Marigold (center left) and tours the Lakeland Community & STEAM Center with Reginald Moore (far right), director, Baltimore City Recreation & Parks. Photo courtesy of Northrop Grumman. Just one year ago, Marigold arrived from Ghana, with a love of reading but limited spoken English skills. After a year of hard work in Lakeland’s ESOL program, her English language speaking skills have blossomed. In addition to volunteering as a guide in the STEAM Center (which stands for science, technology, engineering, art, athletics, and math), Marigold serves as captain of her school’s competitive cybersecurity team. UMBC’s partnership with Lakeland Elementary/Middle School began in 2013. “The history of the Lakeland partnership has been wide-sweeping and centered on wraparound services to address the needs of the administrators, teachers, students, parents, and the community at large,” explained Rehana Shafi, director of UMBC’s Sherman STEM Teacher Scholars Program and partnership with Lakeland. Started through the vision and support of George and Betsy Sherman and the Sherman Family Foundation, the Sherman STEM Teacher Scholars Program prepares UMBC students to become both experts in teaching STEM subjects and civic-minded educators committed to social justice and community engagement in urban schools. 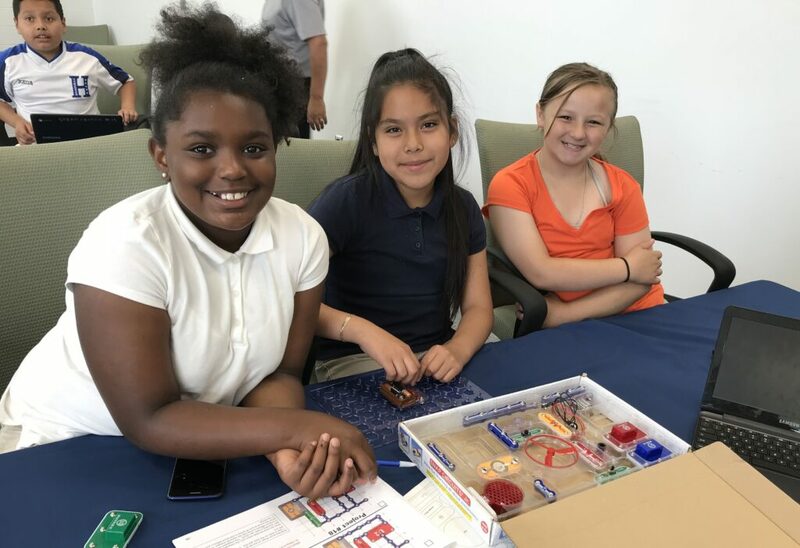 Sherman Scholars provide support for in-classroom instruction and afterschool enrichment, and the program has been closely involved in developing the STEAM center. 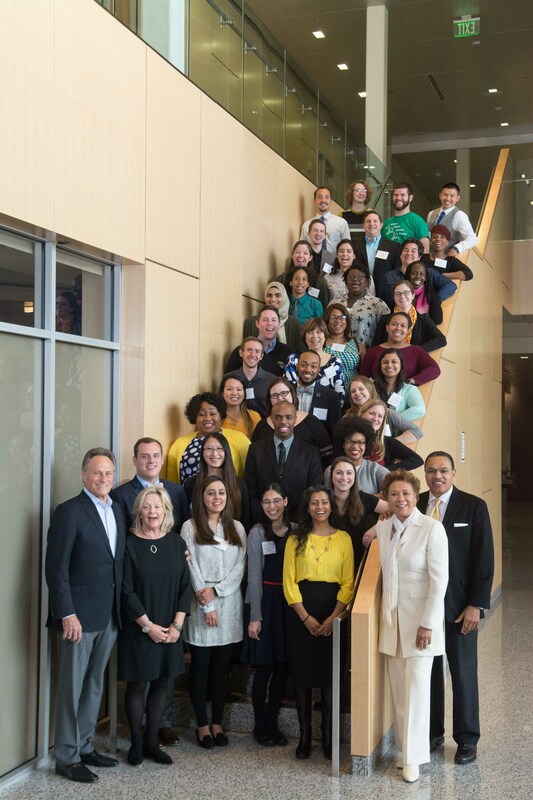 Current and former Sherman Scholars celebrate the program’s 10th anniversary, with George and Betsy Sherman (front left), program staff (front center), and Jackie and Freeman Hrabowski (front right). Photo by Marlayna Demond ’11 for UMBC. The UMBC Peaceworker Fellows Program is also closely involved in the holistic partnership. Peaceworkers focus on community connections, which will grow dramatically now that the new center is open. This is particularly essential in a community without a library or other public meeting areas. The center will give residents access to computers and services like financial counseling, and the community association will soon begin meeting in the space. The opening of the new center represents the growth and lasting strength of this community partnership. Knowing that Lakeland students start walking through the center doors as early as 6:45 a.m., Sandra Evers-Manly, president of the Northrop Grumman Foundation, arrived at the center ahead of the launch event to share in the children’s excitement over their new space. Lakeland students explore new resources in the STEAM center. Photo by Kait McCaffrey for UMBC. This shift is visible in the center’s new recording studio, computer lab, and makerspace. 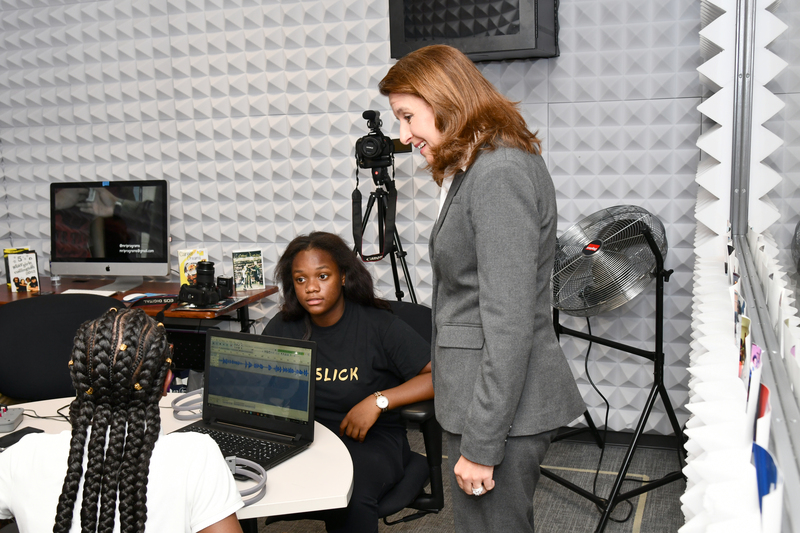 Students can now perform, record, and produce music and audio interviews on site, and the school will have room for robotics teams to develop their projects. The center will also host parenting classes, community fitness sessions, adult education, and mental health services thanks to additional collaborations with local agencies and organizations. “The incredible transformation of the Lakeland Community and STEAM Center will provide a resource for people of all ages to acquire life-changing knowledge and skills,” said Senator Ben Cardin, at the launch event. “Large-scale, positive changes like these usually require a strong group of partners standing shoulder-to-shoulder.” Senator Chris Van Hollen and Mayor Catherine Pugh also spoke to the power of supporting Baltimore City youth through working together. 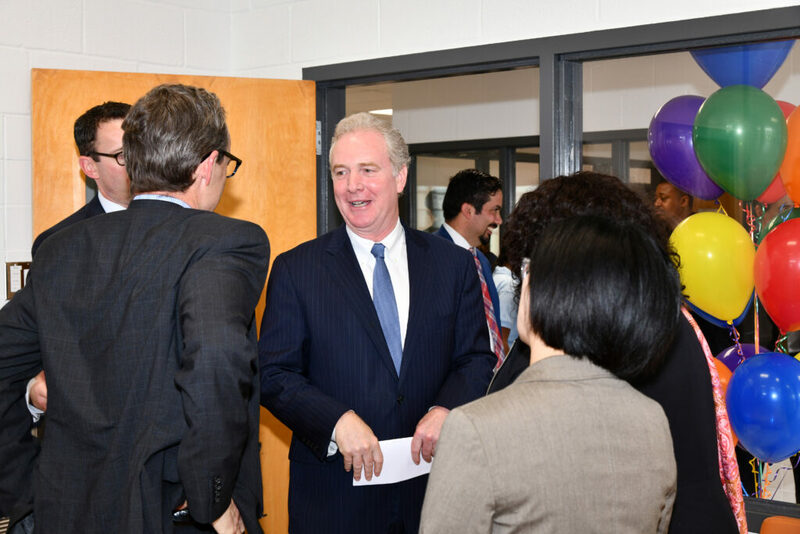 Sen. Chris Van Hollen (center) speaks with Lakeland Community & STEAM Center visitors. Lakeland Principal Najib Jammal in background (center right). Photo courtesy of Northrop Grumman. UMBC Sherman Scholar leads Lakeland students in an activity. Photo by Marlayna Demond ’11 for UMBC. 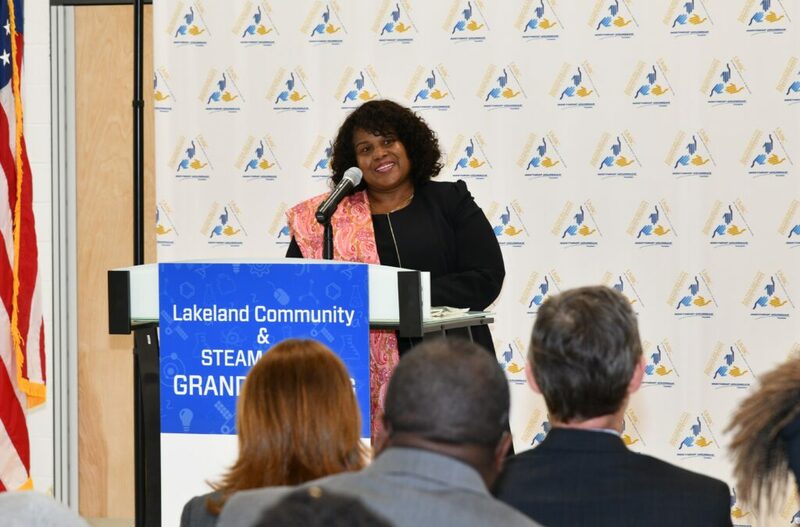 Kenniyah, a rising 8th grader at Lakeland, learned journalism and media skills through the Media and Rhythm Institute, a hip hop youth program the STEAM center and Sherman Scholars brought to Lakeland as the new space was still in development. In the past two years, she has interviewed the mayor, helped create podcasts, and assisted in producing educational DVDs. With the recording studio officially open, she looks forward to expanding her broadcast skills to recording music. Kathy Warden (right), president and COO, Northrop Grumman, discusses media production with Lakeland Elementary/Middle School students in the Lakeland Community & STEAM Center. Photo courtesy of Northrop Grumman. 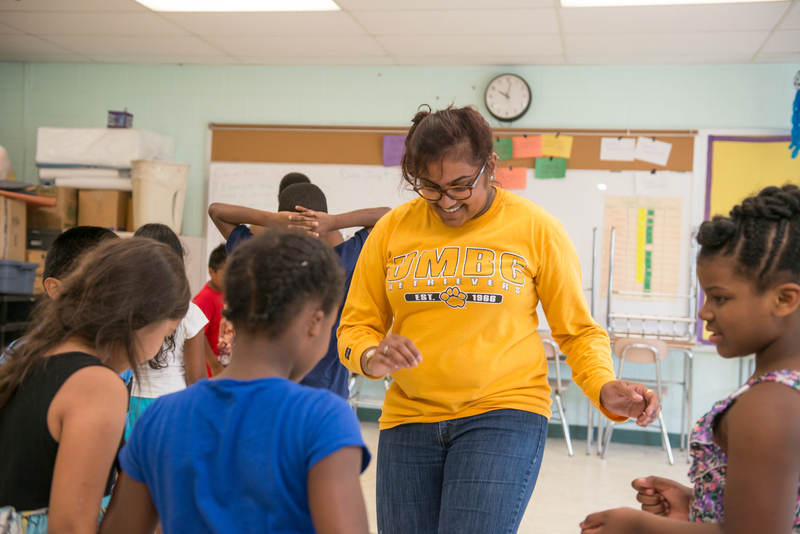 Banner image: UMBC Sherman Scholar leads Lakeland students in a hands-on learning activity. Photo by Marlayna Demond ’11 for UMBC.